I'm Just Me And That's All I Can Be, No More, No Less, No Second Guess. I Laugh, I Love, I Live, I Cry .. And Some Times I Wish That I Would Die. This Is Me And This Is How I'll Stay. I am nothing special of this I am sure. I am just a common man with common thoughts. like everything I've done, but I did it because I'm me. again, I wouldn't change a thing. Why? Because I'm me. to look past the imperfections to see what's right. If you can't do that then it's your loss. I'm the best I can be. 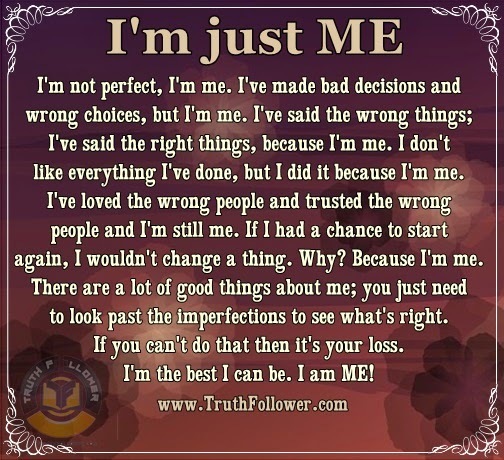 I am ME! I'd rather live life accepting who I am and loving it knowing that i am not perfect, than live my whole life pretending to be. I'm just ME picture/image is an Inspirational Stuff to Inspire and Motivate You. You can download pics by just clicking on the Images. Thanks for visiting Truth Follower an online place for huge collection of inspiring pictures, quotation, and Sayings Images. If you like I'm just ME, Please Share with friends and family on Facebook, Twitter, and Pinterest.